Demystifying the NGSS Science Standards for Stress Free Teaching! I want to welcome Jacki to the Little Bins for Little Hands team. Over the last few months, I have been getting more and more emails regarding NGSS and understanding the Next Generation Science Standards. I am not a science teacher, but I want to give you the resources you need! You can read all about Jacki at the bottom of this page! She will walk with you through understanding the NGSS standards, and help you feel more successful implementing them in your own classroom. We love our simple to use science experiments and STEM activities! 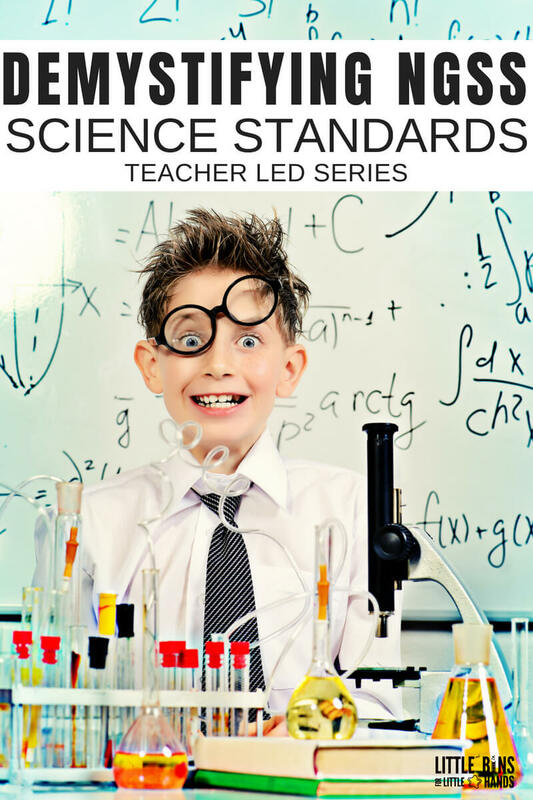 Demystifying NGSS science standards so you can kick-off the new school year stress-free! Your ears start ringing and your vision tunnels in. What does this mean? What am I supposed to teach now? What about my beloved dinosaur unit that I’ve always taught? Can I still teach arctic animals? BREATHE! In and then out! We’re in this together and I am here to share with you some advice for cracking the code of the new standards, help you understand why the sudden switch and show you how to move forward with confidence! So what makes me an “expert” in NGSS? Not much, but I’ve been in your shoes, lived through the no-more dinosaur unit diorama drama and came out smiling on the other side. I also helped my district make the transition to NGSS by serving on the curriculum writing committee! I was a frontline fighter against this new scary business and have lived to tell the tale. So let’s dive in, head-first and get to it! NGSS help coming right up! Read more about me at the bottom of this page. 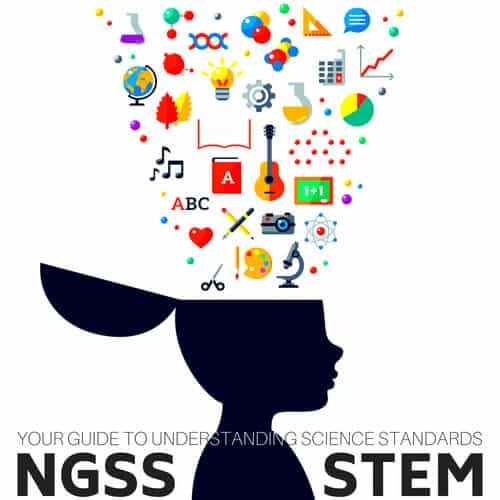 NGSS stands for the Next Generation Science Standards, and they are a set of standards that were developed by representatives from 26 states in 2013. WHY USE NGSS SCIENCE STANDARDS? Sounds pretty familiar right? NGSS is to Science that CCSS is to Language Arts and Math. NGSS is being implemented with the goal of putting all of our students on a level playing field, not just state to state, but also town to town, and on a global scale, with countries like Finland, China, England and Singapore who consistently demonstrate strong performance and skills in the science and engineering fields. Through the use of NGSS in our classrooms, our students will leave us with STEM (or STEAM as we refer to it in my district) skills that they never had before! Problem solving skills, critical thinking, communication, collaboration and analysis skills will be stronger than ever! tNGSS is also driving us teachers to move away from textbooks and toward hands-on learning, allowing us to tap into our students strengths, learning styles and interests with ease. Children will be the center of this learning and will be required to challenge themselves through this “new” style of standards. And even if they are not headed for a science, technology, engineering or mathematics career in their adulthood, they will still benefit from this style of science education. Everyone can use the innovation and thinking skills they will learn through the NGSS, regardless of their future. HOW WILL I USE NGSS? Another important thing to remember is that NGSS are standards, not a curriculum for teaching science. We as teachers have the flexibility to teach and help our students meet these standards in the way that works best for us. 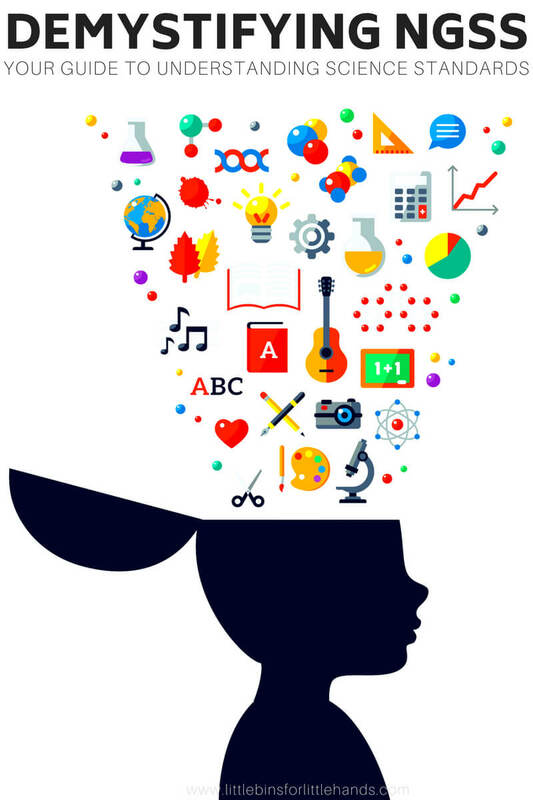 Maybe integrated learning is the big push at your school and you’re using math and science lessons or reading/writing and science together on a daily basis. NGSS will work for you. Maybe you have a designated “Science” block in your daily schedule (major jealousy if this is you). NGSS will work for you too! Many of the concepts and units you already use to teach science to your students will still apply under NGSS. You will simply need to align them with the corresponding standard. So while, “dinosaurs” may no longer be specifically in the standards, and your dinosaur diorama project now seems obsolete…. You will be able to take that project, rubric and experience, and align it with something you have to teach with NGSS, like animal habitats. You CAN make it work for you and your students. NGSS is NOT a one-size-fits-all kind of thing. I want to reassure you, you will NOT have to start again from square one, even as a veteran teacher! If you have NEVER taught science before, there’s no better time than the present to begin. So, the long and short of it is, NGSS is not the enemy. You should feel empowered to continue to teach science using most of the tools, texts and projects you’ve always used. Plus you can adapt others to fit the standards along the way. You should feel liberated that you can bring back those hands-on experiments that may have gone by the wayside over the years. Get your kids directly involved with their learning again! You should also feel confident knowing that you are a good teacher. By taking the time to research and learn more about NGSS, you will only become an even better teacher! Hats off to you, your students are lucky to have you! In the following weeks Jacki will be sharing a variety of topics related to NGSS science standards. I’m really excited to have her on our team. Plus, she will be going grade by grade to present you with a more detailed look at what NGSS standards might look like in your classroom along with activity choices. Make sure to subscribe to our newsletter! 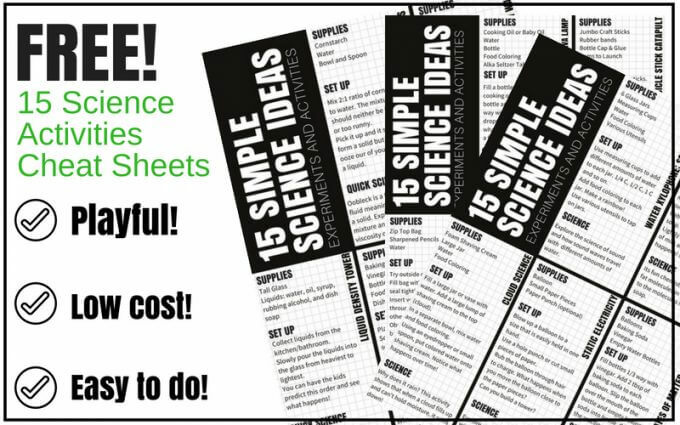 Never miss a new article and receive our monthly science/STEM printable calendar too! NGSS was designed by 26 states, for the states and NOT by or for the US dept. of Ed. The committee formed to create NGSS had teachers, scientists and researchers on it, so our voices were represented and heard. NGSS was created to level the playing field globally, in states and in towns, for the STEM/STEAM field careers. NGSS, much like CCSS, strives to prepare our students for college and career readiness. NGSS helps students develop critical thinking skills, innovation, communication and collaboration skills regardless. NGSS is NOT a curriculum, but rather a set of standards, intended to guide and shape instruction of science. Hands-on learning is the encouraged methodology for implementing these standards in the classroom, regardless of grade-level or age of students. NGSS allows teachers to continue to use many of the lessons and units they are already using, but now with the “back-up” of specific standards. NGSS is NOT one-size-fits-all and teachers should feel the flexibility to make it work for them. Jacki is a 7th year teacher from Connecticut that has taught both Kindergarten and Second grade. Receiving her Bachelors of Science degrees in Elementary and Special Education from Salve Regina University in Newport, RI and her Masters of Education in Elementary Education from Cambridge College in Springfield, MA. Jacki is a dual certified teacher with a wide variety of in-class experiences across many grade levels. She has worked for her district writing curriculum surrounding play and integrated learning as well as science and NGSS implementation. She prides herself on trying new things in her classroom each year, in order to best support her students and make learning fun! She uses flexible seating, yoga, project based learning and LEGO learning in her classroom, as well as other up-and-coming initiatives such as NGSS. Jacki is a national presenter for Staff Development for Educators and loves to share ideas with other teachers on her teacher Instagram, @littlems.2ndgrade. Click on blue links or images below. New topics added weekly! Thank you for the information. I will be starting as a STEM/STEAM teacher this year! Looking forward to all the information you can share! Thank you for taking the time to clarify and keep us informed. This is great! Awesome thank you for the feedback!